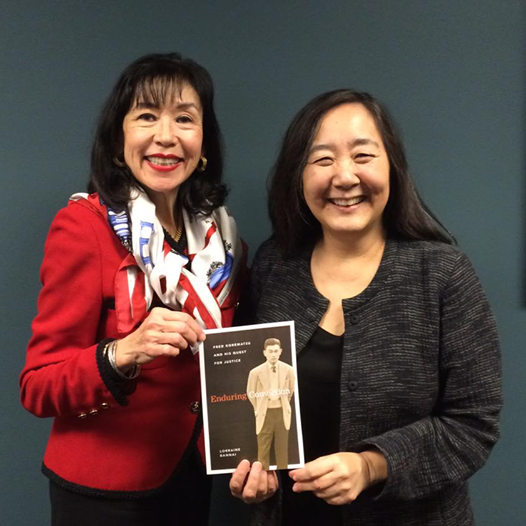 Lorraine Bannai (right) with Karen Korematsu, Fred Korematsu’s daughter. 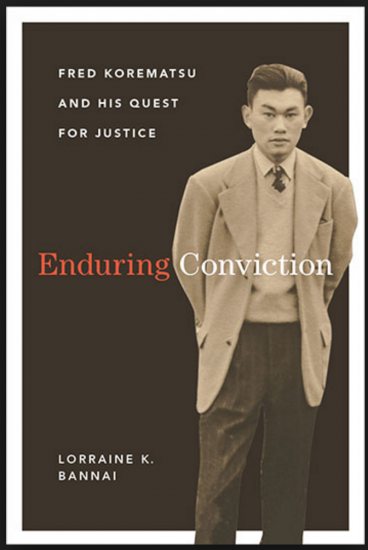 “Enduring Conviction: Fred Korematsu and His Quest for Justice” by Lorraine K. Bannai has been published by University of Washington Press as part of the Scott and Laurie Oki Series in Asian American Studies. Korematsu’s decision to resist President Franklin D. Roosevelt’s Executive Order 9066, which provided authority for the internment of Japanese Americans during World War II, was initially the case of a young man following his heart: he wanted to remain in California with his white fiancée. However, he quickly came to realize that it was more than just a personal choice; it was a matter of basic human rights. After refusing to leave for incarceration when ordered, Korematsu was eventually arrested and convicted of a federal crime before being sent to the internment camp at Topaz, Utah. He appealed his conviction to the Supreme Court, which, in one of the most infamous cases in American legal history, upheld the wartime orders. Forty years later, in the early 1980s, a team of young attorneys resurrected Korematsu’s case. This time, he was victorious, and his conviction was overturned, helping to pave the way for Japanese American redress. Bannai, who was a young attorney on that legal team, combines insider knowledge of the case with extensive archival research, personal letters, and unprecedented access to Korematsu his family, and close friends. She uncovers the inspiring story of a humble, soft-spoken man who fought tirelessly against human rights abuses long after he was exonerated. In 1998, President Bill Clinton awarded Korematsu the Presidential Medal of Freedom. Bannai is director of the Fred T. Korematsu Center for Law and Equality and professor of legal skills at Seattle University School of Law.